U.S. Raises Flag in Cuba After 54 Years, Prisoner Exchanges and “Stork Diplomacy”; Embargo Remains | Democracy Now! director of the Cuba Documentation Project at the National Security Archive at George Washington University. He’s the co-author of the book Back Channel to Cuba: The Hidden History of Negotiations Between Washington and Havana. Mother Jones has just published the epilogue to an updated version of the book, to be published in October, which includes the secret story of how Obama used back-channel diplomacy to normalize diplomatic relations. a former Cuban diplomat who served as ambassador to Belgium and Luxembourg, and head of the Cuban Mission to the European Union. He is a scholar and writer and former Havana University professor. He is now an editorial board member of Temas, a leading journal of social sciences and the humanities in Cuba. JUAN GONZÁLEZ: Today, the United States and Cuba are taking the next step in restoring diplomatic relations with each other. Secretary of State John Kerry arrived in Havana this morning to attend a ceremony marking the reopening of the U.S. Embassy there. Joining him are three marines who lowered the flag at the embassy in 1961, when the U.S. cut off ties to Cuba after Fidel Castro toppled the U.S.-backed government of Fulgencio Batista in 1959. These same marines will raise the flag over the embassy. Ahead of his trip to Havana, John Kerry appeared on the Spanish-language TV network, Univision, and said the United States will continue to push for changes in Cuba. SECRETARY OF STATE JOHN KERRY: I think that as we begin the process, compared to the 54 years of what has been going on, which is no progress, we will begin to see a transformation take place. More people will travel. There will be more exchange. More families will be reconnected. And hopefully, the government of Cuba will itself make decisions that will begin to change things. And so, I don’t think you can measure a month and a half, since we concluded the agreement to actually open the embassy, to 54 years. That just doesn’t work. Now, our spokesperson for the State Department spoke out publicly from the podium of the State Department criticizing those people, you know, that move on Sunday, and we will continue to speak out. Our preference is obviously for democracy, for a full embrace of the freedom of the Cuban people to choose their future. And that’s what we’re—that’s what we stand for. AMY GOODMAN: Meanwhile, on Thursday, Cuban revolutionary leader, former President Fidel Castro celebrated his 89th birthday. He met with two close allies—Bolivian President Evo Morales and the Venezuelan president, Nicolás Maduro—as celebrations were held throughout the country. SERGIO SUÁREZ: [translated] Our comandante has been a father for Cuba and the entire world. Historically, he has been a man, since he was born. Today he turns 89 years old. He has been an honest man. And all that he has done has been for the social well-being of Cuba and the rest of the world. AMY GOODMAN: Well, for more, we go now to Havana, Cuba, where we’re joined by Dr. Carlos Alzugaray Treto, a former Cuban diplomat who served as ambassador to Belgium and Luxembourg, and head of the Cuban Mission to the European Union, scholar and writer, former Havana University professor. In Washington, D.C., we’re joined by Peter Kornbluh, who’s director of the Cuba Documentation Project at the National Security Archive at George Washington University, co-author of Back Channel to Cuba: The Hidden History of Negotiations Between Washington and Havana. Mother Jones has just published the epilogue to an updated version of the book, which includes the secret story of how President Obama used back-channel diplomacy to normalize diplomatic relations. We welcome you both back to Democracy Now! Let’s begin, though, in Havana. If you, Carlos Alzugaray Treto, can talk about the reaction right now in Havana to this day of the U.S. Embassy raising the U.S. flag over the embassy for the first time in more than half a century? CARLOS ALZUGARAY TRETO: Amy, thank you for having me. It’s great to be once more with Democracy Now! I think that how we are looking at it is trying to get an answer to—the question is what kind of change this represents. Is this only a change of tactics to continue trying to overthrow the Cuban government by different means? I call it the Roberta Flack strategy—”killing me softly with your song.” On the other hand, maybe what we are seeing is an important change of strategy by which the U.S. now is saying, “OK, there is a legitimate government in Cuba. Everybody in the world has normal relation with Cuba. We should go for that, because that’s how we best serve American interests in Cuba in terms of trade, exchanges, and even the interest of the Cuban-American community.” I think that the American government, by sending Mr. Kerry to Cuba, who is not—he is an important political figure, to Cuba to raise the flag, I think that they are pointing in the second direction, the direction that they want a normal relationship with the Cuban government. And this is welcome news. I think—I mean, the flag could have been raised on July 20th. That was when the American Embassy started to become an embassy, the interest section became an embassy. They could have sent an undersecretary, but they preferred to say, “OK, let’s wait until Secretary Kerry’s very tight schedule permits for him to go to Havana and do it.” And I think we appreciate in Cuba he is doing it. This is—and I want to address the criticism from Marco Rubio—I think this is an eminently intergovernmental affair. And what this situation represents is that now, with the embassy, the relationship with the Cuban government, the American relationship with the Cuban government becomes at the center stage, which is how it should be with every country in the world. Embassies are accredited to the government of the country, not to the whole civil society. They have the right to talk to the civil society, but they don’t have the right to prioritize civil society, opposition civil society. That’s because, again, here is a difference on why the—how do we perceive civil society. But what is happening now is, in the past, the U.S. prioritized these so-called dissidents—I don’t like the name—and the Cuban government was not a legitimate government. Now, what they are saying: “Yes, the Cuban government is a legitimate government, and we have to talk to them.” And that’s reasonable. That’s pragmatic. That’s the way to go, even though the differences will remain there. JUAN GONZÁLEZ: Peter Kornbluh, I’d like to ask you—people tend to forget that when President Obama was running for president in 2008, he was criticized then, but talked about the need for the United States to talk with its traditional enemies, to negotiate with them. And now we’ve seen the breakthrough in terms of Iran and of, obviously, the situation in the change of relations with Cuba. You talk in your piece about the back-channel talks that went on, apparently for years, to get to the point that we are now. Could you talk about some of that, especially the role of Pope Francis? And you mention a group called the Trimpa Group that most Americans have not heard about. PETER KORNBLUH: Well, let me just say, Juan, that I couldn’t agree with Carlos more. He is right on point when he says that John Kerry’s presence in Cuba today is an extraordinary, important gesture by the Obama administration. There’s a little nuance there, which is that Kerry had broken his leg. He had fallen off his bike in Europe and broken his leg, and he wanted to go to Cuba when he could actually walk down the Malecón or on a Cuban street, which he will be filmed doing, I believe, and so there was a delay in his ability to go, beyond his busy, busy schedule, which involved, of course, these very tense negotiations over an accord with Iran. And, of course, Barack Obama ran for president back in 2007, 2008, on a platform of having a dialogue with our closest of enemies, and at that point, Cuba and Iran, North Korea. He was basically saying, “Let’s, you know, engage rather than aggress.” And he has really followed through on that. AMY GOODMAN: This is one of the wives of the Cuban Five. PETER KORNBLUH: Yes, one of the wives of the Cuban Five, Gerardo Hernández’s wife, Adriana Pérez. And that story hasn’t been fully told. The Cubans actually came to the State Department with a diplomatic note saying, “Could you help this woman get pregnant, as she approaches the age of 40, because we don’t see how her husband, who’s serving two life sentences for spying in the United States, is ever going to get out?” Of course, he did get out. And when he came back to Cuba on December 17th of last year, his wife made a public appearance. She was nine months pregnant. The world saw for the first time what had happened. And the story continues to come out of how the United States and Cuba negotiated that particular aspect of this ongoing dialogue. The pope got involved. The secret communications with him were extraordinary, circuitous. It’s a really fascinating story, but it gets down to one issue: the commitment on both sides to arrive at this point today, in which flags fly above the Cuban Embassy in Washington and the U.S. Embassy in Havana. They fly in what I like to say are the winds of change in the U.S. relationship with Cuba. JUAN GONZÁLEZ: And, Peter, could you talk about the Trimpa Group and its role in this? PETER KORNBLUH: Well, of course, you know, political change doesn’t come to Washington easily, and there’s all sorts of creative lobbying forces that go on here every day. And unknown to most people, an extraordinary Cuban-American woman, Patty Ebrahimi, who was in Cuba, and she was on a People-to-People delegation, and she was restricted from—she had grown up in Cuba, and she was restricted, even on this delegation, from going around, seeing her old house and going to find her old schoolmates. She happened to have resources and—her and her husband—donated money to the Trimpa Group, which is a Denver-based philanthropical/lobbying organization, which pairs kind of deep-pocketed donors who care about social issues with kind of a political strategy and a political effort to change social policy. And in this case, it was foreign policy. And she set out to support kind of efforts to lift the ban on travel to Cuba, which, by the way, is still in place and still needs to be lifted in its entirety. And the Trimpa Group came to Washington. They became part of a network of advocacy groups who had been working on to change Cuba policy for many, many years—the Center for Democracy in the Americas, the Washington Office on Latin America, the Latin America Working Group—I mean, organizations here in Washington that have been working conscientiously to change this policy for many, many years. But, you know, with a new kind of player in town, a new strategy, access to the White House that money brings, there was a whole kind of set of initiatives that didn’t really push Obama to change his mind, but gave him the kind of political cover that he believed was needed in order to take this momentous step. And to the credit of all the players involved—and they all deserve credit, and I hope we all give them credit in the new epilogue of our book, Back Channel to Cuba—this is an extraordinary story. We don’t see changes in intractable foreign policy issues like the one with Cuba very often. And this one is going to go down in history along with China, along with the rapprochement with the Soviet Union and détente with the Soviet Union. Détente in the Caribbean, finally, really marks, in some ways, the end of the Cold War overall, and hopefully a new beginning, not just in U.S.-Cuban relations, but for U.S. foreign policy overall. AMY GOODMAN: Peter Kornbluh is co-author of Back Channel to Cuba, and we’re going to come back to him, as well as Dr. Carlos Alzugaray Treto, former Cuban diplomat, who is with us from Havana, where at the moment of this broadcast we are just about an hour away from the U.S. flag being raised by the three marines who 54 years ago took that flag down in the early days of the Eisenhower—in the final days of the Eisenhower administration. We’ll be back with them in a minute. AMY GOODMAN: This is Democracy Now!, democracynow.org, The War and Peace Report. I’m Amy Goodman, with Juan González. Our guests on this historic day, when the U.S. Embassy raises the U.S. flag over its Havana embassy, are Dr. Carlos Alzugaray Treto, former Cuban diplomat—he is with us from Havana, and Peter Kornbluh, co-author of Back Channel to Cuba, is with us in Washington, D.C. We want to turn to two former Cuban revolutionary combatants who say socialism will live on in Cuba as the country normalizes relations with the United States. JOSE BUAJASAN: [translated] We think rapprochement with the U.S. is a success of Cuban policies. They have been unable to destroy us. Now they will use the second lane, as they say. It’s fine. They will come here precisely using the economic problems we have. They will use them. Evidently, they will try to capture people. But we can also teach them many things. 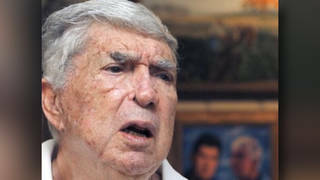 ELADIO AGUIAR: [translated] We are prepared for that, for a long fight, and to finally overcome all these difficulties. Of course, we do not expect the U.S. to become a socialist country in the long run. Nor do we claim that, either. But they should at least learn to live civilly with us, who have never caused any harm to the U.S.
AMY GOODMAN: And former Cuban President Fidel Castro wrote in a newspaper column that the U.S. owes Cuba “millions of dollars” as reparations for its decades-long embargo. Fidel Castro wrote, quote, “Cuba is owed compensation equivalent to damages, which total many millions of dollars, as our country has stated with irrefutable arguments and data in all of its speeches at the United Nations.” Let’s go back to Havana right now to Dr. Carlos Alzugaray Treto, former Cuban diplomat. If you can respond to what the former president, Fidel Castro, has said, the issue of reparations, and then the concerns of the former revolutionary combatants in Cuba? CARLOS ALZUGARAY TRETO: Amy, I would like to pick up, before answering that, pick up where Peter left it. By the way, I congratulate Peter and Bill for their recent article in Mother Jones, excellent, as the book itself. The Obama administration is doing this with a small country, not with a big power like China and Russia. And this is significant. This gives to the Cuban victory a special flavor. We got the United States to accept that a small neighbor deserved to be treated that way. And when people compare previous visits, I was trying to search previous visits of secretaries of states to Cuba, and they’re very few—back in the '40s. It seems that the United States didn't consider Cuba an important diplomatic place where you would send the secretary of state. So, that’s why Kerry’s visit is important. The other point is that the most important American leader that came to Cuba before 1959 was Richard Nixon, when he came to Cuba during Batista’s regime, in practice, to legitimate an electoral fraud that Batista had carried out in 1954 to legitimize his coup d’état in 1952. Having said that, I think that Fidel is right. I was—even at the beginning, I was one of the officials who was involved back in the 1990s to answer the question, how much the blockade, embargo, economic sanctions have cost Cuba over these many years. And we came up with this figure. I can tell you, the Cuban side has made a very serious study, without—let’s say, without overblowing the data. You must remember that there were 3,000—at least 3,000 Cubans killed by terrorist acts carried out by CIA-trained elements in the '60s. So, Cuba is right in demanding compensation for the damages caused, because, let's face it, the embargo, the so-called embargo, was carried out under the—and this is a direct quote from a State Department document—”to bring about hunger, desperation and the overthrow of the Cuban government,” end of the quote. So, Cuba is right when they are demanding—when we are demanding that we be compensated for the damages that the embargo, the sanctions have caused to Cuba. That, of course, is part of something that we have to do when we start negotiating compensation for American properties. That’s our side of the issue. JUAN GONZÁLEZ: And, Peter Kornbluh, I wanted to ask you—one part of this whole equation that’s not been part of the negotiations has been the status of Guantánamo. And the United States kept insisting, according to your article, that Guantánamo was not to be discussed in the process of normalization. Could you talk about Cuba’s position on Guantánamo? PETER KORNBLUH: Well, if you look at the whole history of talks between the United States and Cuba, going all the way back to secret talks during the Kennedy administration, you see that when the secret negotiations became serious, U.S. officials put issues like compensation for expropriated properties and Guantánamo kind of at the bottom of the list, because they were the biggest and hardest issues to resolve. And during previous talks, there had been an idea that these issues had to be resolved before we could arrive at normal relations and normal diplomatic relations. That would be the ultimate moment after all these other issues were resolved. And to his credit, Barack Obama and his team basically said, “Let’s normalize diplomatic relations. And then, under the realm and under the kind of new umbrella of normal civil relations, let’s address these big issues, such as nationalized expropriated properties, such as Guantánamo.” Those are both very difficult issues. Guantánamo, obviously, will eventually be returned to Cuba, because it is Cuban sovereign property. Some people here in the United States say we should just, you know, leave the base and leave the torture center there and give it to Cuba and let them deal with this problem. They probably will deal with it much more effectively than we have. But Cuba will be returned to Cuba the same way the Panama Canal Zone was returned to Panama. It’s Cuban property. It’s still kind of a sore, festering issue for the region to see the United States occupying that particular part of Cuba. What Raúl Castro has said repeatedly is, “For us to have truly normal relations with the United States, we obviously need to be able to exercise control over our sovereign property of Guantánamo.” So, eventually that will happen, but it’s not going to happen anytime soon. I’m glad that the two sides didn’t decide they had to resolve this issue before we arrived at today. And I think it will be easier to resolve over the course of three or four or five years in the future, depending on who the next president of the United States is, under this new kind of regime of better relations that the two countries now have. AMY GOODMAN: It’s always astounded me that—what the U.S. has done with Guantánamo, because the U.S. has criticized Cuba for not being democratic, and yet they have this sort of beachhead there, and what do they use it for? A showcase of democracy? They use it for more than a decade now to hold well over a hundred—actually, hundreds of men. Many of them have been cleared for release. A number of them have been tortured by U.S. soldiers. That’s what they’re showing the people of Cuba a government should really be doing. It’s quite something. JUAN GONZÁLEZ: And, Carlos Alzugaray, I’d like to ask you about the domestic impact of these changes in Cuba. Obviously, after Raúl Castro succeeded Fidel as president, there was a move toward liberalization of the economy. What do you think you would see as the potential changes in the Cuban revolution and in the Cuban socialist model in the coming years? CARLOS ALZUGARAY TRETO: I see three major transformations taking place in Cuba at the—right now, at the same time, although the three of them began at different moments. First is the economic transformation, as you pointed out. The economic transformation requires political changes, because you will have decentralization in the economy, in general, and you will have a larger nonstate sector. So these two changes will lead to political changes to adapt the political system to the way that the economy works. But at the same time, Raúl Castro, in different locations, has said, “We have to advance in our democracy. We have to have a better democracy, a more consistent democracy. I invite everybody to disagree.” And he has even said the best decision comes out of a broad and profound discussion of different policy options. You cannot have anything more democratic than that. And at the same time, there is this transformation which is the normalization of relations between Cuba and the United States. But remember—and this is something that people have to not confuse—the political changes in Cuba began before. For example, 2013, there was an immigration reform. The immigration reform allows now every Cuban to travel outside Cuba whenever they want with only a passport. This is a major change, a very important change. Secondly, there is an opening of the public space, the introduction of TeleSUR as one of the television companies that is watched in Cuba, but also Internet. Internet now is—well, the Cuban government has pledged to provide for every Cuban home Internet by 2020 at an affordable price. Now, all these things are happening not because the United States is pushing or pressing Cuba to do that; it’s because there is a political will inside the government to do this. If the government of Cuba would be in a difficult position, it wouldn’t have launched these three major transformations. This is the reflection of a government that is sure of what they are doing. And I think most Cubans are happy with that. We are trying to do it. I work for a journal that has a public debate every month on public issues. We discuss practically everything that is in the minds of Cubans. And if you go to Facebook, you go to Twitter, you have more and more Cubans who are revolutionary, who are socialist, and yet they don’t hesitate to criticize the government for its policies. This is the normal way of doing. This could not be done in the past, because we were under siege. That siege, I don’t think—and Peter’s and Bill’s book proves it—I don’t think you can ever emphasize how much the United States did to bring about a regime change in the '60s and even in the ’70s. That started to change a little bit with the Carter administration, but the United States was back at it in the ’80s. There was a head of the interest section in Cuba who came here and spent a month meeting with dissidents and people of the opposition—again, I don't like the term—and he didn’t even go to the Ministry of Foreign Affairs to introduce himself to the Cuban government. That’s not the normal diplomatic procedure. The first thing that any ambassador or envoy does is go to the Ministry of Foreign Affairs and say, “I am here. I am here to work for better relations.” That’s what should from now on. AMY GOODMAN: And, of course, there were the repeated attempts to kill, the U.S. government involved with, the CIA involved with the attempts to assassinate Fidel Castro. Now, Fidel Castro visited the United States in 1959 and actually met with then-Vice President Richard Nixon before diplomatic relations were cut off in 1961. Now, there’s some talk that Fidel’s brother, President Raúl Castro, could come to the United States. And I wanted to ask you: Will he be coming to the United States? There’s talk also that Kerry being in Havana is setting the stage for President Obama to go to Cuba before the end of his term. CARLOS ALZUGARAY TRETO: I don’t discard that that might happen. I don’t think it will happen soon. But that’s an interesting question. One interesting thing about Raúl Castro is that he doesn’t attend very many international events. He rather likes to be here in Cuba working for the changes that are taking place. He is not a big traveler, if you compare him with Fidel or with some other heads of state who travel a lot. He likes to be here. And that’s good, because the perception is that he’s taking care of the problems we have, which are big. If President Obama comes to Cuba, I think he will be welcome, as we are welcoming the pope. We have welcomed two popes, and now a third pope is coming in September. The president of France was here. So, that—those are possibilities. But in my view as an—let’s say, an elder diplomat, is that it will take some time. But it would be good for both sides to start normalizing relations, and visits of heads of state are part of a normalized relation, even though, one must say, heads of state visit friendly countries, not unfriendly countries. AMY GOODMAN: And, Peter Kornbluh, yes, the pope is going to be coming to the United States, but first he’s going to Cuba in September. PETER KORNBLUH: The pope is going to Cuba. There will be quite a bit of coverage. I think you’re going to get a sense today, of all the coverage of Kerry’s trip, of the visuals that are involved. Then the pope is going, and then it will be massive coverage of that. And he will certainly talk about the embargo and the need to lift the embargo, when he’s in Cuba. But then he’s going to come to the United States, and I’m sure he’ll kind of give his blessing to those advocates who are pushing in Congress to lift the embargo and truly normalize U.S. commercial, economic ties with Cuba. But I think that on the private agenda of John Kerry in his meeting this afternoon with the foreign minister of Cuba, Bruno Rodríguez, after the flag is raised—I think on that agenda is a discussion of the conditions and circumstances and logistics of a presidential visit to Cuba early next year. Barack Obama has not only made no secret that he’s interested in going to Cuba, but he’s kind of gone out of his way to have his spokesman plant the idea that he wants to go and, in some ways, intends to go. He understands that his going to Cuba would create visuals of normalcy, of diplomatic interaction, of a head-of-state visit, just like Carlos pointed out, like other heads of states go to Cuba, that will consolidate these changes and add momentum and pressure to fully normalize trade relations, lift the embargo, lift the travel ban with Cuba. This is part of his legacy to have a Nixon-in-China moment in Cuba. It will certainly be extraordinary for the Cubans and for the American public to see their president on that beautiful island. AMY GOODMAN: Well, we want to thank you both for being with us, Dr. Carlos Alzugaray Treto, speaking to us from Havana, Cuba, former Cuban diplomat, and Peter Kornbluh in Washington, D.C., author of Back Channel to Cuba: The Hidden History of Negotiations Between Washington and Havana. This is Democracy Now! When we come back, the case of Julian Assange and Chelsea Manning. Stay with us.